Delhi, June 26, 2012: BIG AIMS (Animation Infotainment & Media School), a premier animation and VFX training academy of Reliance Animation today entered into a strategic collaboration with Lovely Professional University (LPU) to introduce first of its kind degree program in Digital Animation Film Making & Digital Visual Effects Film Making in India, along with Diploma and Certificate Courses. The MoU was signed between Ashish S Kulkarni, Chief Executive Officer, Reliance Animation and Mr. Ashok Mittal, Chancellor, Lovely Professional University. Under the MoU, BIG AIMS and LPU will offer the finest Bachelor of Science Program in Digital Animation Film Making & Digital Visual Effects Film Making. The program will expose and prepare students to the creatively exciting animation and film making industry with an unmatched degree program by LPU in association with BIG AIMS. The courses have been designed to harness best creative and technical talents in students. The Bachelor of Science Program in Animation & Visual Effects Film-Making will be made available to students across India through authorised BIG AIMS learning centres. For those looking for focused career options within a short turnaround time BIG AIMS will be offering LPU affiliated Diploma and Certificate courses. These courses will help the students to gain mastery in these specialised areas of knowledge in a shorter span of time. The USP of all the courses is the innovative curriculum underlines the core principles of Animation and VFX Filmmaking that position it primarily as an artistic vocation with technology seamlessly integrated. The program will help groom the creative and artistic talents of the students so that they can manoeuvre the latest technology as per the demands of the artistic needs of the medium, which is the very essence of Animation and VFX Filmmaking as per the global demands. “For Animation, VFX, Gaming and Comics as an industry, the greatest assets are the people in its various techno creative departments and not the machines and software’s. It’s the mind of the creative workforce that makes the tools come alive turning celluloid dreams into reality. 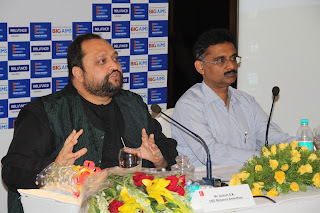 At BIG AIMS we are dedicated to groom the minds of our young generation as unique creative individuals who aspires to find themselves as leaders in the emerging digital era of creative expressions.” added Ashish. BIG AIMS, a premier animation and VFX film making academy of Reliance Animation, is part of Reliance Entertainment – the largest entertainment group in India. BIG AIMS has been incepted to bridge the gap between present training methodologies and answer the real professional needs of the animation, VFX filmmaking industry. In other words, BIG AIMS positions itself as an Academy that inculcates learning in the real-time production environment to equip the students to perform as per the demands of the industry from day one. 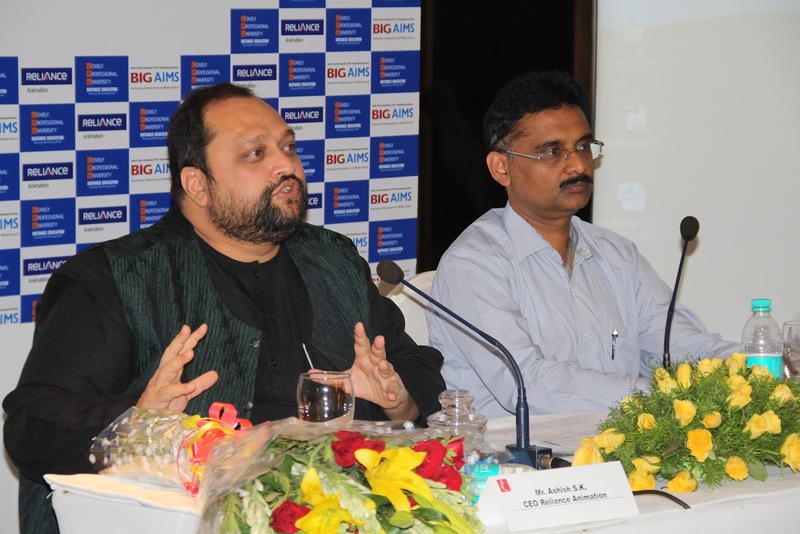 BIG AIMS centers are already operational in Ahmedabad, Bangalore, Bhopal, Chennai, Delhi, Hyderabad, Indore, Jaipur, Kolkata, Mumbai, Pune, Surat, and Nagpur. BIG AIMS’s young animators and VFX film makers have already been placed successfully in some of the most renowned studios in the country like Accel Animation Studios, Fountain Pixel Animations, Prime Focus, Pixion, Prana Studios, Reliance Animation, Reliance Media Works, Side FX Entertainment, Ven Sat to name a few. Lovely Professional University is India's Largest University*(* In terms of students on a single campus) with more than 25000 students (on one campus) is the culmination of mammoth efforts to change the shape of the Indian education to bring it at par with global standards and to shape the future of aspiring students by providing them a world class platform to hone up their talents. The University believes in” Transforming the Education”, to create “Well Qualified Professionals” who can be employed effectively from day one, once they have completed their studies. This is achieved by inculcating in the students all those traits and skills that are required at the workplace, to make a complete professional. This approach of Lovely Professional University is what prompted us to get into an association with them. There is rising concern across the country about the large scale arrests and harassment of Muslim youth by the security forces of the state. Young men are being picked up without explanation, taken into police custody, beaten and tortured and eventually thrown into jail awaiting trial for years on end. Several have died in custody, the latest case being of Qateel Siddiqui who died in mysterious circumstances in the Yerwada Jail, Pune. He was arrested last November and killed in a high security prison for a case in which his complicity had still not been established. There has been silence about the disappearance of Fasih Mahmood, the engineer picked up in Saudi Arabia. Except for denying any knowledge of his whereabouts, there has been no response from the UPA government about efforts to trace an Indian citizen whose family is now running from pillar to post in search of Justice. Urdu journalist Syed Kazmi remains in jail on charges of terrorism, with the police still to file a chargesheet against him. These are just a few cases of hundreds, with official reports now admitting that a majority of prisoners in Indian Jails are Muslims. Citizens concerned about the increasing intolerance and authoritarianism of the Indian state where the minorities no longer feel safe in their own homes have decided to come together to organise a Public Meeting to raise a voice against injustice and what amounts to state terror. A resolution calling upon the state for remedial action at different levels will also be adopted at the Meeting that will be addressed by political leaders and senior representatives of civil society. We call upon you to join and support the initiative that is part of a series of protests held by civil society on this issue in Delhi and other states over the last few weeks,by sending us a line with the name of your organisation. Mohammed Adeeb, MP, Rajya Sabha. I've written you quite a few emails. Today, I want to hear from you. Because at 19 weeks out, every decision we make today is more important for this election than the decisions we made yesterday. From staffing plans to on-the-ground organizing strategies, these decisions will only get more important from here. You're someone who's let us know at some point that you stand behind this president, and you have a stake in how we grow the most effective grassroots army possible between now and November. So we want to hear it straight from you: What's working? How can we inspire more people to join us? And how's this election shaping up from your perspective? Please take a minute to answer a couple questions here. What you tell us is going to help shape our strategy to inspire other supporters to help grow this campaign. You'll help determine the very best way we can communicate the President's accomplishments to the rest of the country. I'm asking you because supporters like you have driven this campaign from the very beginning. The President has counted on you to get us here, and how we move forward from now until November 6th is up to you. THE ŠKODA PRIZE announces ‘Call for Entry’ for its 3rd edition ü Applications to the prestigious ŠKODA Prize for Indian Contemporary art will be open from June 30, 2012. New Delhi – June 22, 2012: Launched in 2009, by ŠKODA Auto India and Seventy EMG, The ŠKODA Prize is recognized as one of the most of influential platforms for Indian contemporary art. Call for entry begins on June 30th, applications are available on www.theskodaprize.com and will be accepted until 31st August 2012. The prize brings together a diverse pool of nominees from across India and includes internationally recognized artists as well as newer talents. Nominees need to be below the age of 45, and should have had a solo show in the country over the last 12 months; they will have demonstrated sustained vision, innovation, and a mature understanding of material and form through their careers. The winner takes away the prestigious ‘The ŠKODA Prize Winner’ title and also receives a prize money of INR 10,00,000. Runners-up are invited to participate in international residencies supported by Prohelvetia, the Swiss Arts Council. Visited by thousands every year, The ŠKODA Prize Top 20 exhibition (which takes place alongside the India Art Fair in New Delhi) showcases country's most promising contemporary artists. Juried by a panel of notable personalities and supported by museums and cultural institutions of international repute, The ŠKODA Prize presents a unique vantage point to engage with some of the most exciting developments in Indian contemporary art today. The jury members of The ŠKODA Prize in the past have included collector Mrs. Kiran Nadar, Mrs. Tasneem Mehta, (Managing Trustee and Honorary Director, Dr. Bhau Daji Lad Museum), artist Vivan Sundaram, Pooja Sood, (Director of Khoj), Heike Munder (Director of the Migros Museum für gegenwartskunst, Zürich) who was also on the jury for this year's Turner Prize, while renowned artists Marc Quinn, and Turner Prize winner Anish Kapoor have presented awards to past winners Mithu Sen (2010) and Navin Thomas (2011). In 2011, The SKODA Prize platform was extended to create a prize for artists at the beginning of their careers with The Breakthrough Artist Award – which recognizes younger artists under the age of 35 - based on their debut solo exhibitions in India. The Breakthrough Artist Award is supported by highly regarded publication Art India (over a decade old magazine). Through its association with ART India, The SKODA Prize also supports the development on critical dialogue, and writing about Indian contemporary art. Mr. Girish Shahane, Art Critic, Curator and Director, Art for The SKODA Prize for Indian Contemporary Art, said “We aim to build on the reputation the award has established as a benchmark of artistic quality, while also attracting more new voices through the Breakthrough Artist Award”. Art India Publishing Co Pvt Ltd, c/o JSW Steel Ltd, Victoria Mills Compound, P.B.Marg, Lower Parel, Mumbai-400013. The ŠKODA Prize is most prestigious award on the Indian visual arts scene. It recognises cutting-edge work demonstrating vision, innovation, and a mature understanding of material and form. The Prize brings to public notice exciting trends in contemporary art, highlighting the output of established mid-career artists as well as new voices. It is backed by jurors of impeccable credentials, renowned patron institutions, a dedicated group of advisors, and a management team of proven capability. The ŠKODA Prize is a Seventy EMG Arts Initiative. Verdict of Shimla Court framing charges against former CM of HP vindicates the stand of India Against Corruption (IAC). When IAC named him as one of the tainted ministers in Manmohan's Cabinet on Mar 25th, he had threatened a defamation suit against us. We demand his immediate resignation. A person against whom charges have been framed by the court for corruption certainly cannot be accepted as a part of central cabinet by the people of India. We demand that he should not be the CM candidate of Congress in forthcoming assembly elections in HP. Because if he becomes the CM, then he would decide the prosecuting and defense counsel both, which would make a mockery of this case and cause direct conflict of interest. This verdict also shows that the evidence presented by IAC against the 15 ministers is credible and actionable. Mrs Gandhi had said that our allegations were baseless. This verdict shows that the evidence presented by us is not baseless. After all, what are we asking for? That investigate allegations of corruption against 15 ministers. They refuse to even investigate. PM has categorically refused to get any independent investigation done in these cases. This is unfortunate. We are confident that if independent investigations were done in these cases, most of these 15 ministers would be in jail. If govt does not set up independent inbestigations, anshan would take place from 25th July at Jantar Mantar.